We were back down to Lake Merritt yesterday and the ducks were too. Just as GG was wondering aloud as to the possibilities of our rare visitor from Asia returning as well; she spotted him. Last year GG was down there and ran into a couple of our local Celebrity Birders (yes, celebrity birders) and they were searching for the rumoured Tufty. This is now his third year on the Lake that we know of. We spotted him around the same area of the lake. He obviously has joined a flock of lesser scaups, although I doubt he gets to breed with them. We will return to look for his mate. 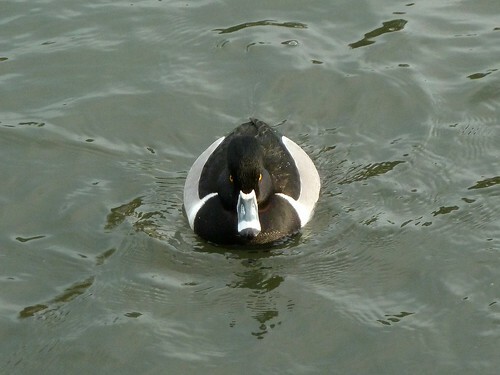 The tufted duck is a threatened species. We kept looking for a possible mate or friend and GG spotted another (not quite as) rare visitor. Hawkeye (GG) really can spot 'em. These two individuals are the only ones of their families around. 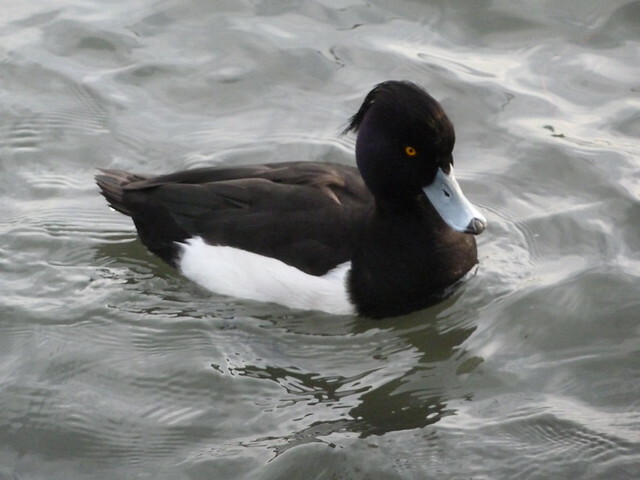 There are dozens of lesser scaups, greater scaups, coots, mallards, canvasbacks, buffleheads, goldeneyes, pie-billed grebes and western grebes. She's amazing.